"Blue cheese contains natural amphetamines. Why are students not informed about this?" -Mark E. Smith, Lead singer of a UK 'post-punk' band "The Fall"
There are only a handful of dairies that have made this cheese, many for over 90 years, and it remains name-protected by the bylaws of the Stilton Cheese Maker's Association. It is a cow's milk blue cheese that is usually well-aged (at least 6 months) and should be slightly crumbly yet smooth in texture. It has been described, by Steven Jenkins, as "smooth, rich, and creamy...with layers and folds of honey..and molasses".The bacteria that produce some of these flavors and, of course the blueing, actually occur naturally in the milk and in the air around the processing dairies. As is the issue in many countries, English dairy law has by-and-large transformed the process of using raw milk to make traditional English farmhouse cheeses (like Stilton and Chesire). Many Stilton dairies tried to steer clear of the mass milk-collecting and cheese-producing efforts, that started in the 1930s in England with the Milk Marketing Board in attempt to centralize the growing, dairy commerce. But this effort collapsed with ongoing central government pressures. According to Steven Jenkins, you could not buy unpastuerized Stilton cheese in 1996 (and the Stilton Cheese Makers Assoc. Website, updated in 2006, corroborates this point to the present day). As a general note on blue cheeses: future blue cheese curds are not cooked at high temperatures during production, like they are for many other cheeses, during the stage that involves 'concentrating' the curd by removing the cloudy, liquid whey protein. Heating at high temperatures causes the curds to clump and tighten into a more string-like structure. These non-cooked 'Blues' are merely concentrated and then left to ripen (or 'spoil', in a controlled setting) which allows the visible holes and fissures to promote and fill with bacterial growth. 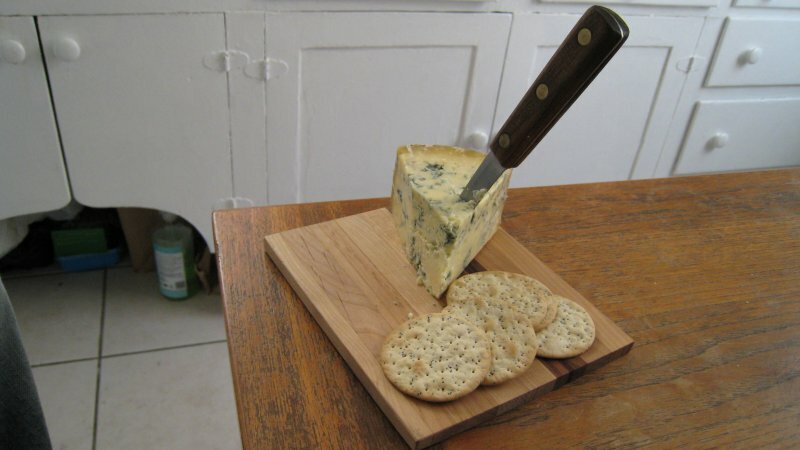 For Stilton, the 'blueing' process starts off naturally and then, often, long needles are often used to aerate the inner curds.